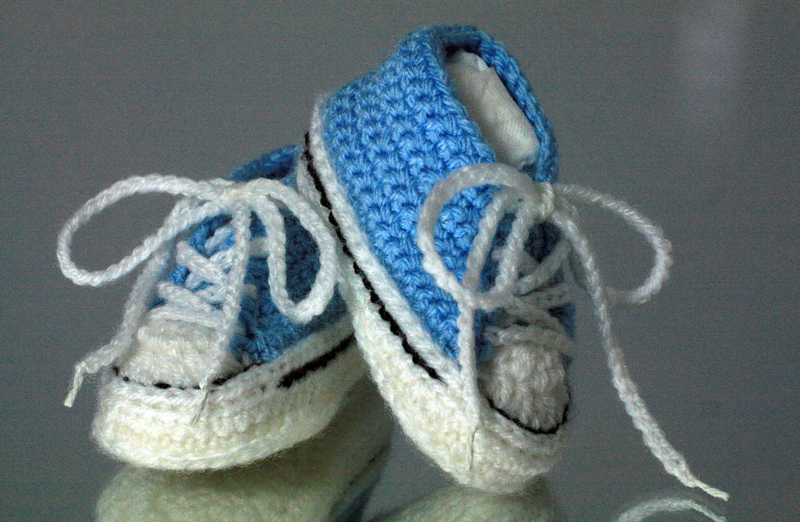 Knitted and crocheted baby clothes and toys. I have been asked many times for the pattern for the squares in the centre of these baby blankets and have been very pleased to share via email upon request. I have had the pattern written up for ages so I thought why not create a post to share the joy that I had in making them. 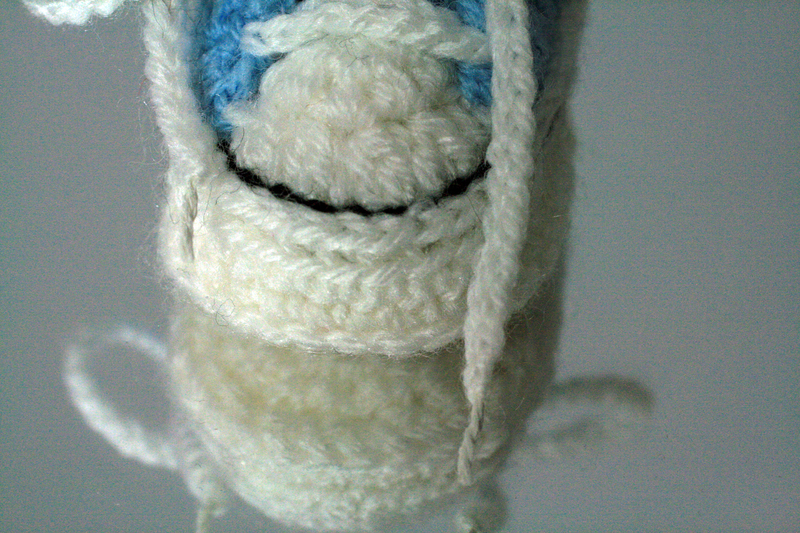 Chain 6 slip stitch into the first stitch to make a ring. Chain 1 (counts as first dc) c 15 into the ring, slip stitch into the first chain made, 16 sts. *tr 4 tog, 3 ch, miss next dc** repeat from * to ** 6 more times, 8 petal clusters formed. Slip stitch into the next 3 ch space, 1ch, 1 dc in same space, * 2ch, (3htr, 3ch, 3htr0 into next 3 ch space, 2 ch, 1 dc in next 3ch space, rep from * 3 times more, omitting dc at the end of the last repeat, slip stitch into first dc. The final round is trebles and I think you will be able to follow that from the images. Any questions please let me know and I will be happy to help if I can. Baby Blanket for a little boy. My lovely daughter called and asked if I could make a blanket for the Christening of her friends baby, “of course” said I “when is it”, “next week” says Miss A.
I said I would love to make something. But within a week? Although I would say that I am not one to be easily deterred from a woolly challenge it would be unlikely to be ready in time for the christening date. We agreed that that would be ok and I have to confess that I was delighted to be given a reason to start this pattern, I have been eyeing it up for quite a while and wasted no time in getting started. I wanted it to be bright and cheery so went for a mix of blues and turquoise with white to give the patches a lift, the soft teddy bearish brown added an nice earthy tone to pull it all together. I just love laying the squares out as you go to mark your progress deriving great pleasure from seeing them all laid out once complete and ready for joining. 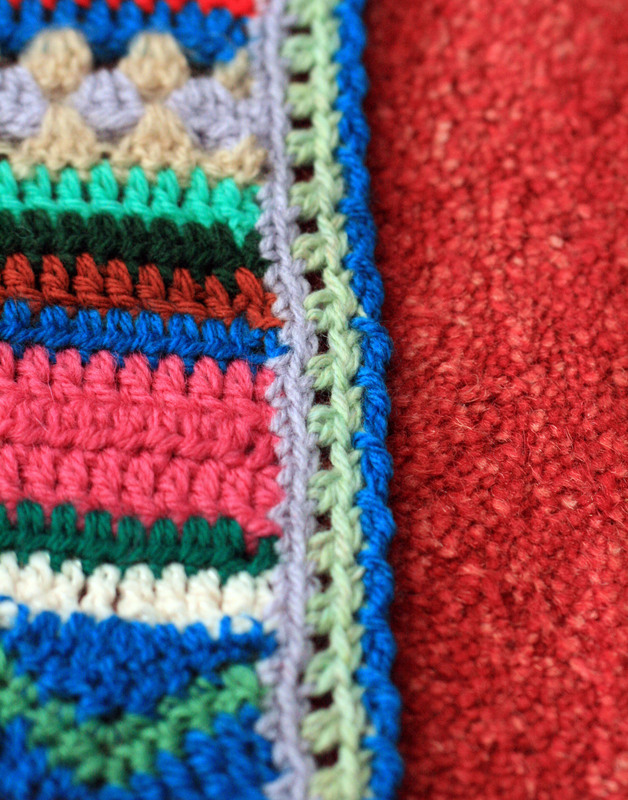 Just to give you a closer view of the different blocks used to create this baby blanket, the heart is made separately then stitched into place in the centre of this simple crochet square. The Catherine Wheel pattern is employed for the one of the rectangle squares. I love the motion you feel with this one. 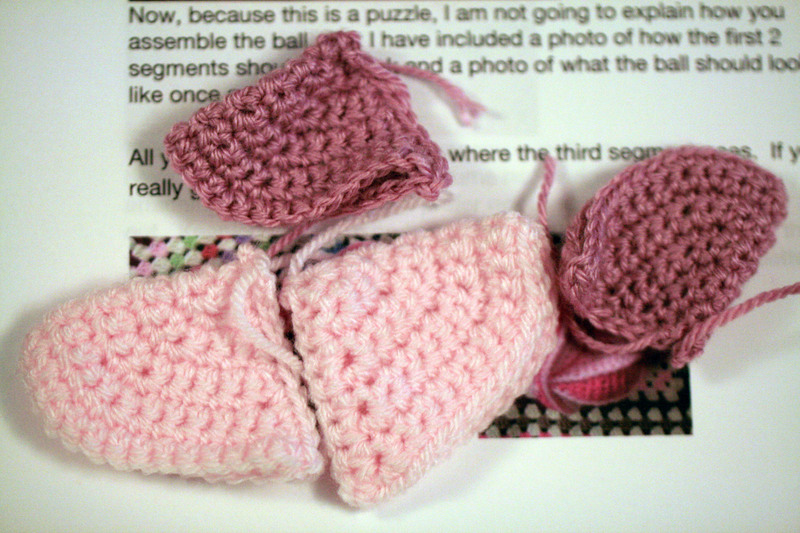 A simple extention to the heart square base using treble crochet stitches. The simple Shell pattern, the only single colour block used. The teddy bear brown surrounds and joins each block together and is also used to frame the simple trebble crochet border before the lacy edging is applied. And then, it’s finished. Ready to wrap itself around a special little man! 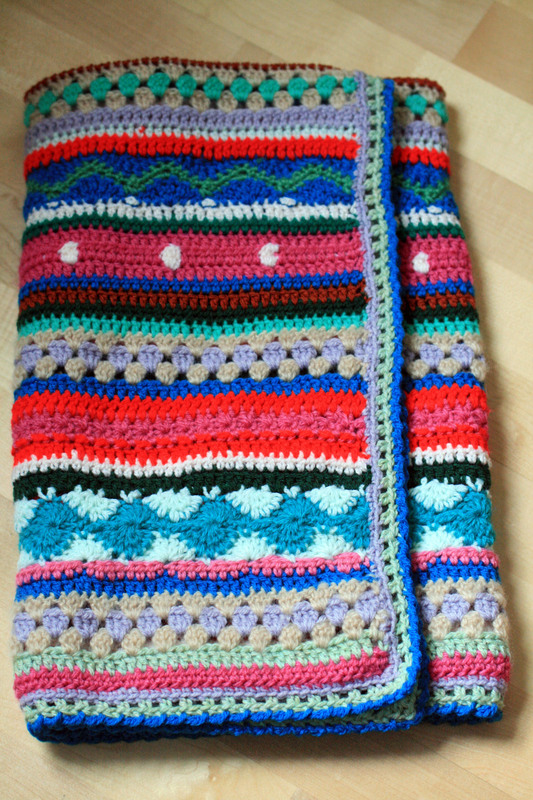 I do so love making blankets and this was such a pleasure I have no hessitation in recommending the pattern from a book I have used many times, Baby Crochet by Lois Daykin. ps. I am going to ask Mama if I can share the photo of the little chap laid on his new blanket, what this space! 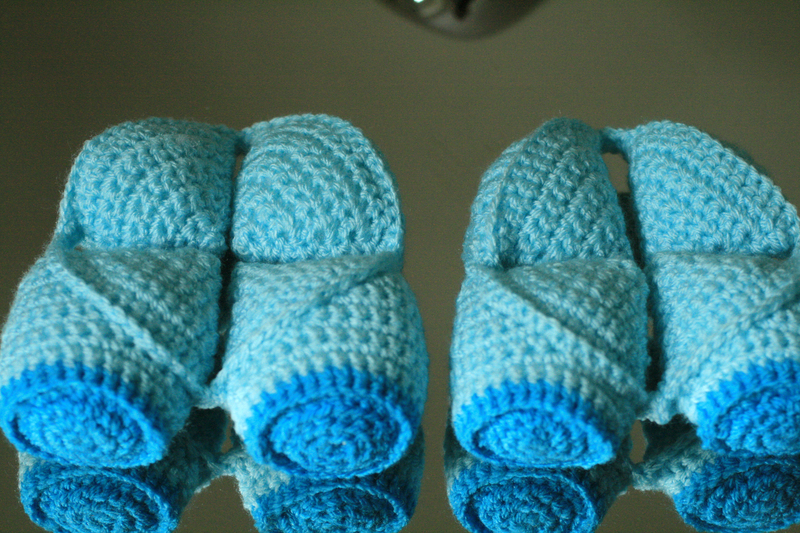 These Teddy Booties are a favourite I have made before several times. Much as I have enjoyed doing the yarn bombing it has been so nice to have the time to make something just because I felt like it, no themes. I do so love these boots. And this little wrap around style jacket is great for baby boys or girls. 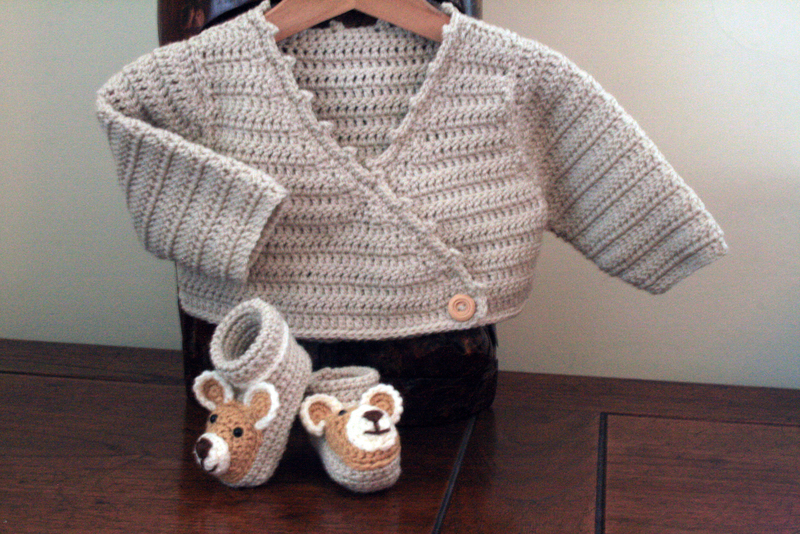 You can just imagine a chubby little babe cosily clad in this cute jacket and bootee set and ready for cuddles. They are both from a book that I love Baby Crochet by Lois Daykin. It is full of toys, hats and bibs to make, even a long colourful snake. Take a peek and see what you think. 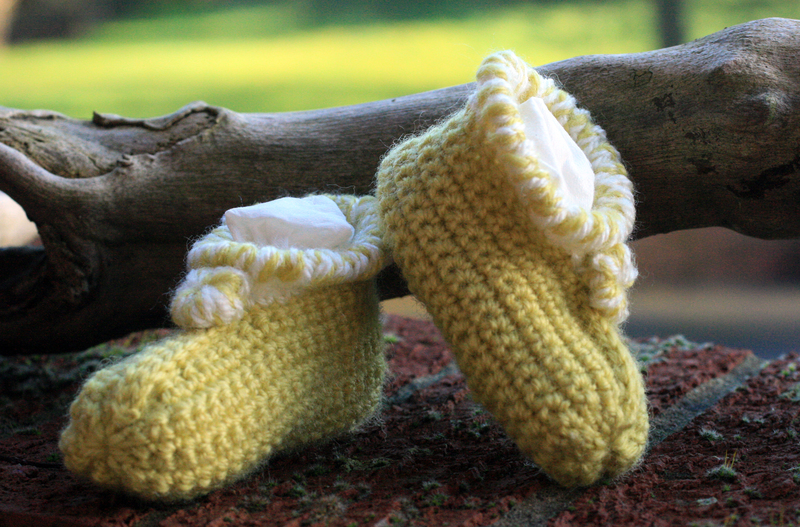 I was reading through posts one day and came across some lovely crochet slippers made by Simply Hooked with an offer I could not resist. 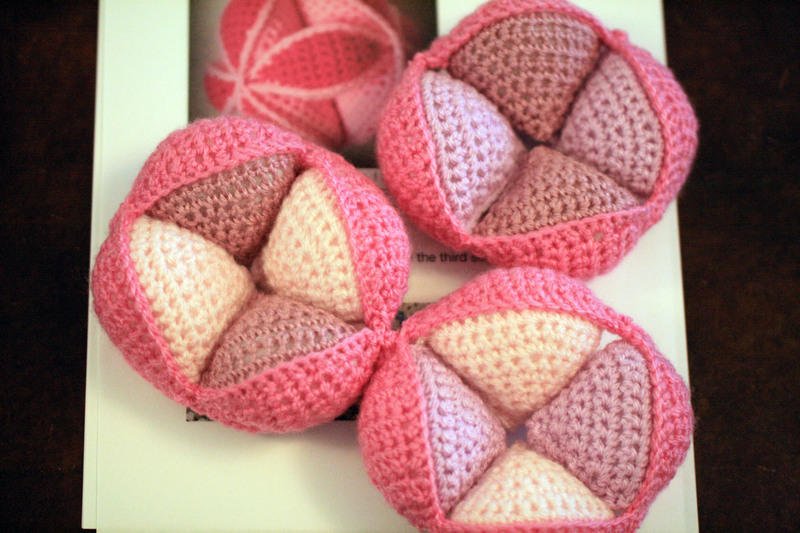 A swap request, offering a pair crochet slippers in exchange for an Amish Puzzle Ball, “well” I thought to myself “I have made these puzzle balls before and I would love those gorgeous slippers”. So here it is ready to be shipped off. And here are the said gorgeous slippers! 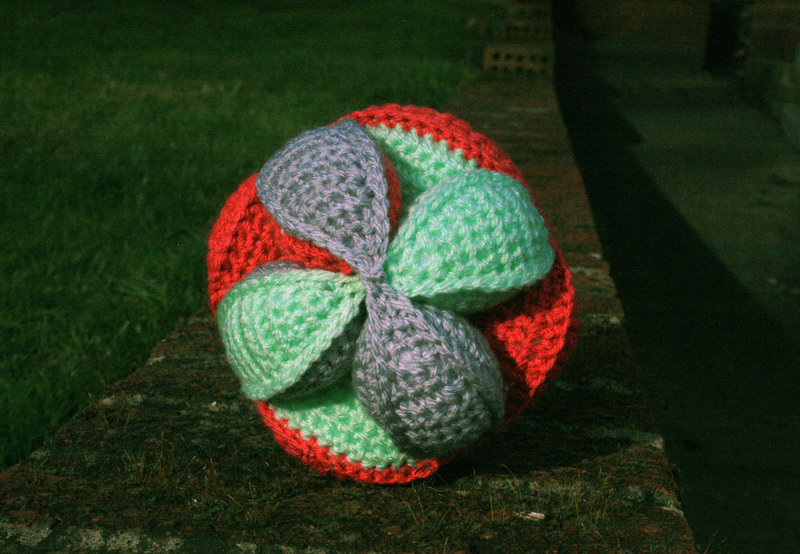 We exchanged emails and Simply Hooked agreed to my swap offer and chose the colours for the Puzzle Ball. If you haven’t seen one before I will try to explain how it works. You make twelve triangular pouches and three rows of lids. Each row of lids is attached to four pouches stuffing each pouch before finally closing it off. So you end up with these. First you interlock 2 of the finished rounds. Then the last round fits into the gaps to make a round ball. 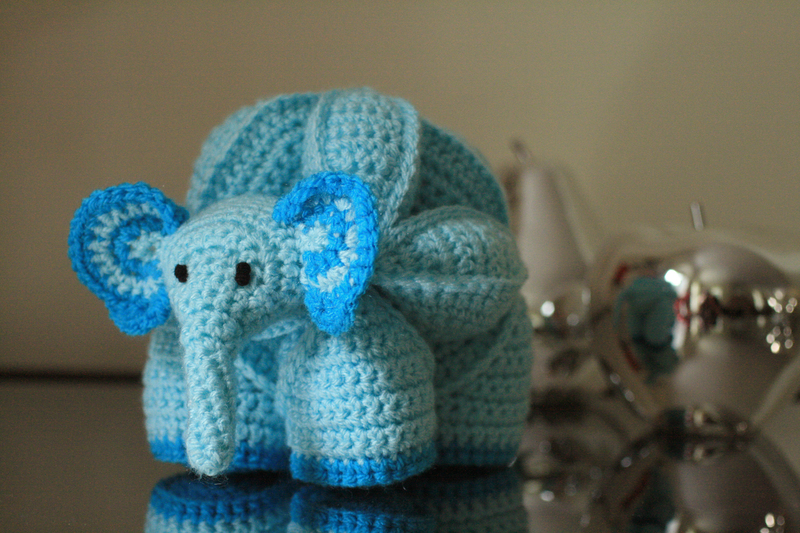 I love this pattern so much, they are quite quick to make and there are animal versions too. I made an Elephant shown in a previous post here. 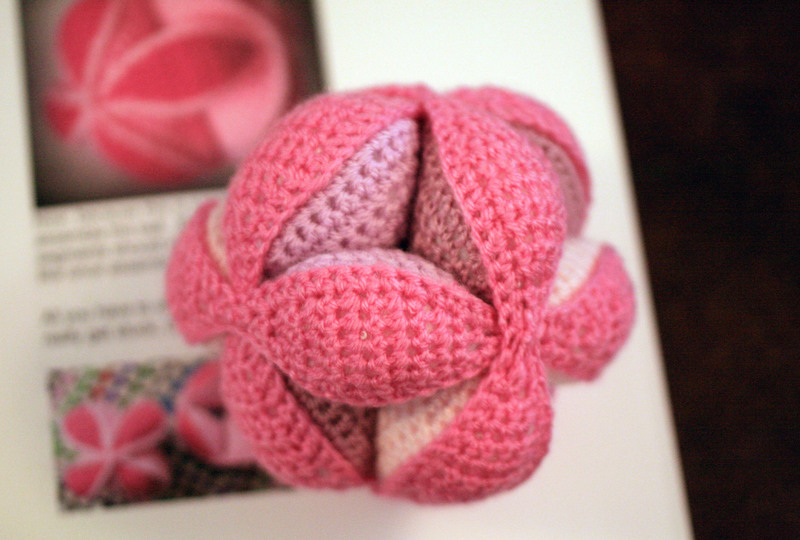 If you fancy making your own puzzle ball you can download the free pattern from Ravelry Amish Puzzle Ball Pattern, there is also a flower version which is delightful. These two patterns are kindly available free thanks to Dedri Uys. 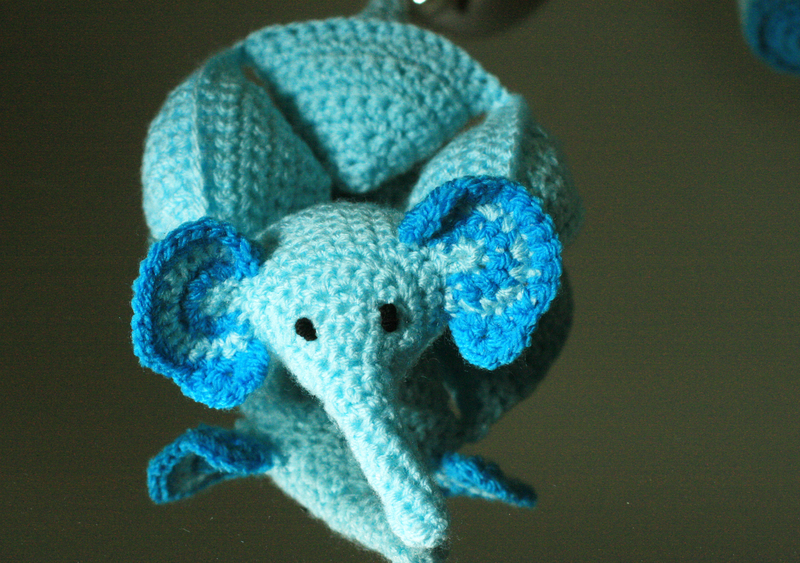 The Elephant Puzzle Ball pattern is available to purchase on Ravelry too. 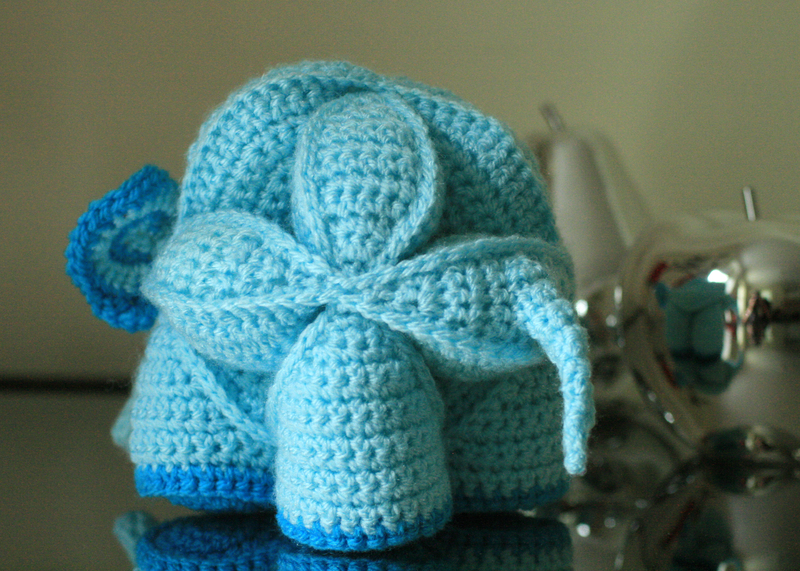 Dedri is obviously quite dedicated, I talked in my post about how struggled a little with the elephant head and Dedri was kind enough to contact me and advise that she had altered the pattern and asked if I made one again would I let her know if it was better. How kind was that? 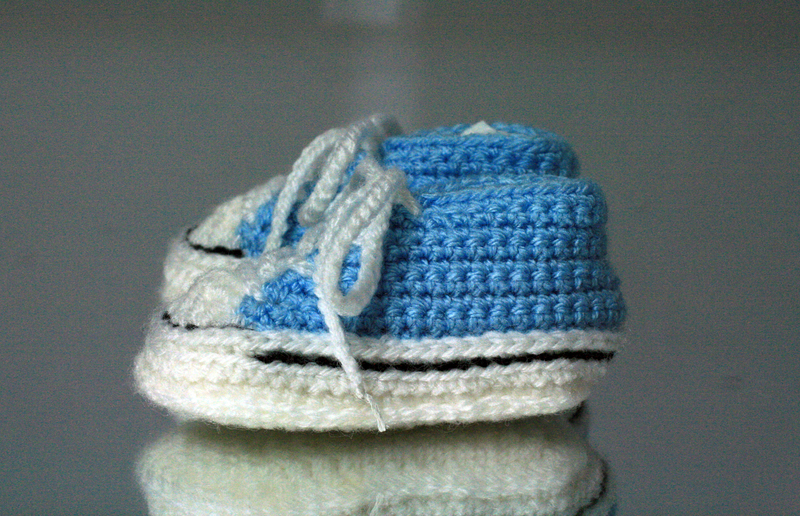 Another pair of converse style booties have found their way to a little one. I think I could become addicted to making these! I do so love them in the red! They can be seen here in light blue on a previous post. I also made a another little pair of boots. I wanted a really simple pattern and could not find one so decided to have a go at making one up myself. It is not a replica of an original or anything fancy but it is still cute…… I think! It is a very popular pattern around the globe and has been translated into Swedish byPysselkiisen, Spanish by Duendecilla. and more recently Italian by Mirella. Thank you to all of the above for making this pattern so accessible. My daughters friend is expecting her first baby in February, they have literally been friends all of their lives. Their birthdays are only 6 weeks apart and they had their first playdate when they were just 6 & 12 weeks old, they started school together at the same nursery when they were three and shared classes all the way through their senior years in education. It is quite amazing seeing this young lady that I have known all her life producing a new life herself. 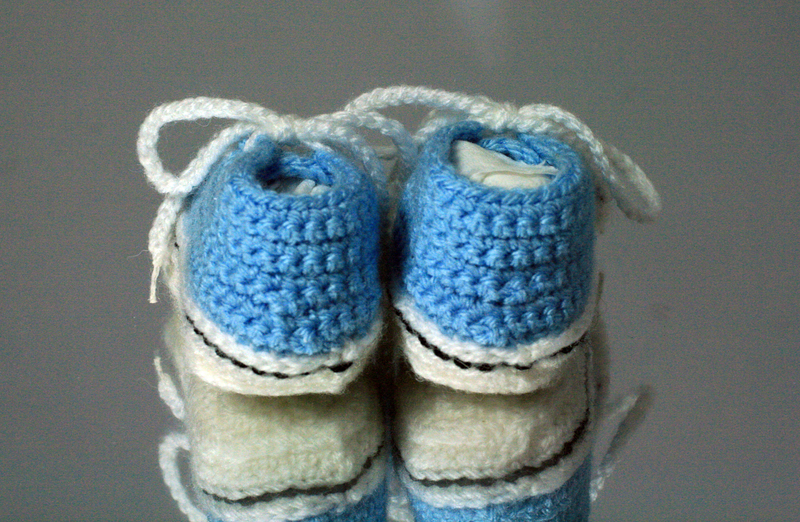 I could not resist making these Converse style bootees for the little man, yes she already knows IT’S A BOY! This cute pattern has been squirrelled away in my little stash, of ‘things to make one day’, for a while now and I have been waiting for the opportunity to give it an airing. I must be honest and say that it was on the third boot that I felt happy with how it was looking, it took the three goes to get the hang of making the front sit nicely – this was totally down to me being too eager to finish and not reading the pattern more carefully. I have taken shots from all angles so you can get a good all round view so on to the side. The black trim line makes them look like the real thing don’t you think? As I so often do I I have used good old Stylecraft DK which is always so great to work with, the choice of colours is fantastic especially for these little boots. And the back, I still think I should be able to improve on the joins that you can see on the white sole here. Then on to my favourite finishing touch – the laces! I love the finishing touches on this pattern, it describes how to coat the end of the laces in glue and leave to dry before trimming so they look like real laces. 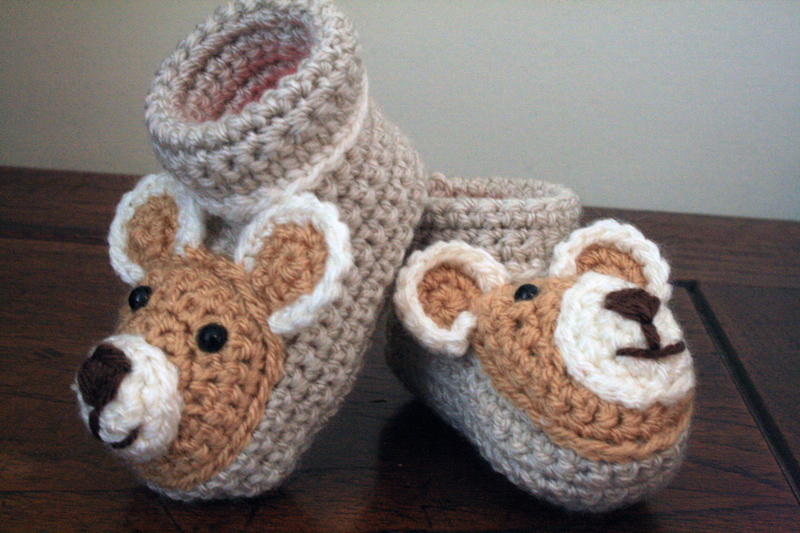 So if you have a little critter of your own or indeed anyone else’s you want to make these for……… the pattern by Suzanne Resaul is available via the home of many great patterns – Ravelry. It is a very popular pattern around the globe and has been translated into Swedish by Pysselkiisen, Spanish by Duendecilla. and more recently Italian by Mirella. 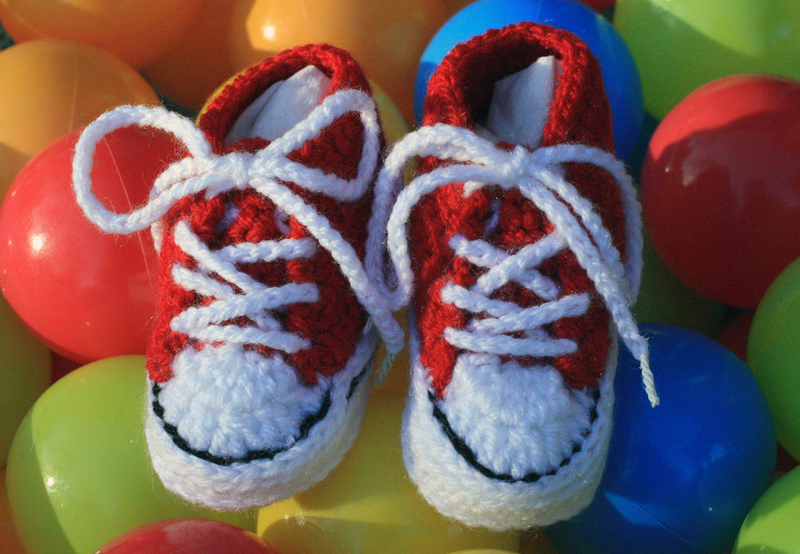 Please note that this pattern has kindly been made available for you to use and enjoy free of any charge, also you may sell shoes from the pattern, the only thing is that is required is that you give the credit for the pattern design to Suzanne, and lets face it, she really does deserve it. Elephant Amish Puzzle Toy (but not quite a ball)! Here he is at last the finished Elephant! I have to admit that I have rather mixed feelings about him, he certainly has not been the easiest of makes. I found the pattern quite tricky to follow but I am not sure if some of this was in the translation. Has anyone else made him? If so I would be interested to hear how you found it. Maybe I was just having a bad week!! Anyhow he is done now and I thought you might like to see all the bits that make him. The principles are the same as the other Amish ball puzzles, made up of three rings. Two leg section. And the third section hosts the head and tail. Here are all the parts together in a collapsed heap. I got a little disheartened and confess that he stood eyeless and without his tail on my mantlepiece for a week until my eldest daughter came home at the weekend for a visit. She was rather taken with him and gave me the encouragement to spend the required 10 minutes to finish him off, so on went the eyes and the all important tail. 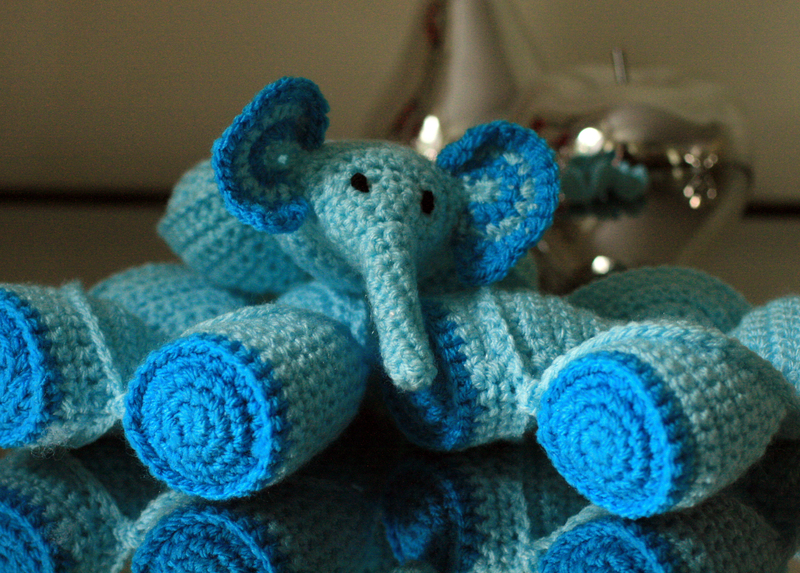 He has started to grow on me and I love the idea of a crochet toy that has an interactive measurement to him, kiddies can take him apart and build him up again. I have thought about making a couple more, maybe a hippo and a giraffe so you could mix them up and make a giraffaphant an elippo or a hipporaffe. If you fancy having a go you can buy the pattern for £2.00 on Ravelry, it is another from the Dedri Uys collection. I am so taken with these fun little balls, I have made 3 regular ones now and I also had a go at an elephant but that is another story! Thought I would try the flower version to add to my growing collection. It works pretty much the same as the other pattern in principle except you make flowers for the tops instead of the oval shapes. 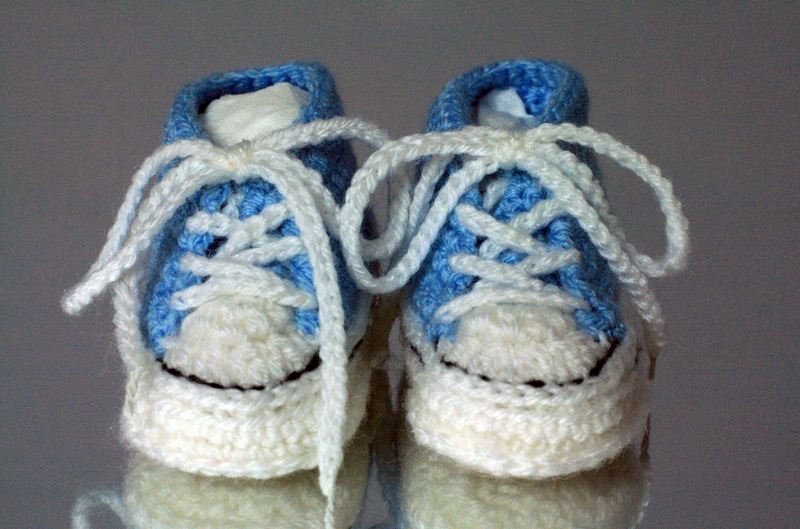 I did download a pattern here which is free, thank you to Dedri Uys, check out her pages on Ravelry she has lots more ideas using this unusual pattern. I regret to say that I was not keen on the four petal flowers so decided to adapt the flowers a bit and have tried making a 5 petal version. I also chose to make a multi coloured version rather than the monochrome style shown in the pattern. I am hoping to get it finished in the next couple of days so I will let you see how it goes. Here is my finished blanket, it is only a baby sized blanket which will explain how I have finished whilst this great CAL is still ongoing. With the blanket about the right size I needed to think about the edging. 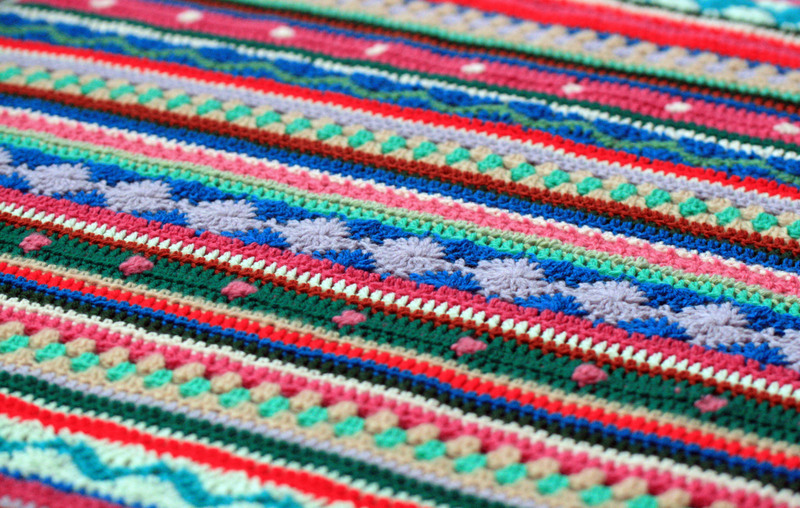 I always feel that this is such an important part of a blanket as it frames it and pulls it all together to showcase the pattern. 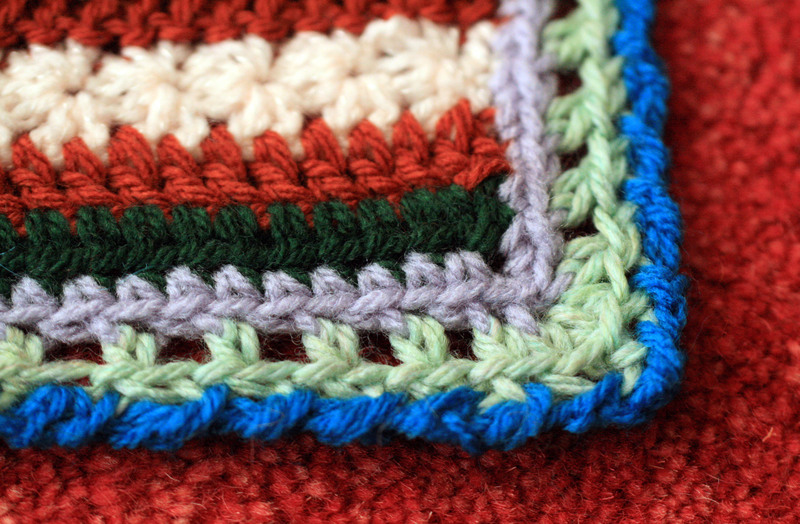 As there is a great deal of pattern going on in this blanket I wanted to keep it really simple. 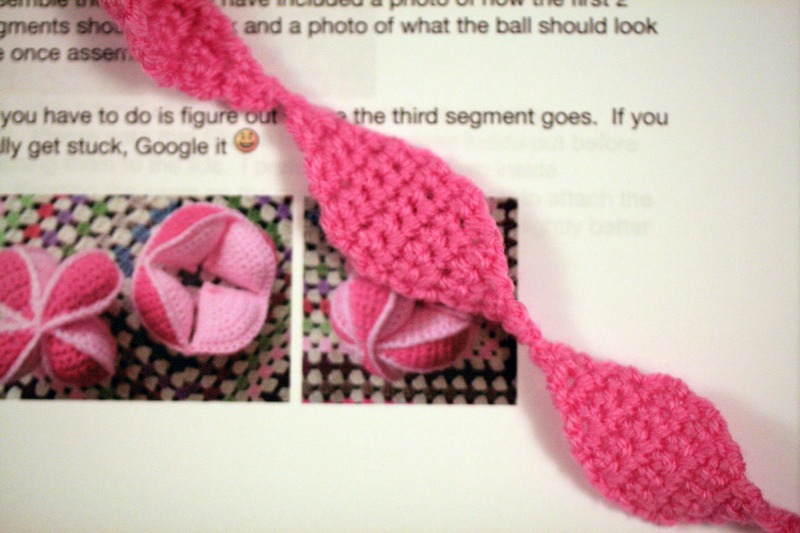 I started with a simple double crochet followed by a round of 1 half treble chain 1. Then I tried a stitch I haven’t used before as a final finishing round, reverse double crochet. I think I will be able to get this stitch neater next time I do it. If you haven’t tried it it is a single crochet but you work from left to right and creates a rolling twisted stitch that also has a bit of depth. 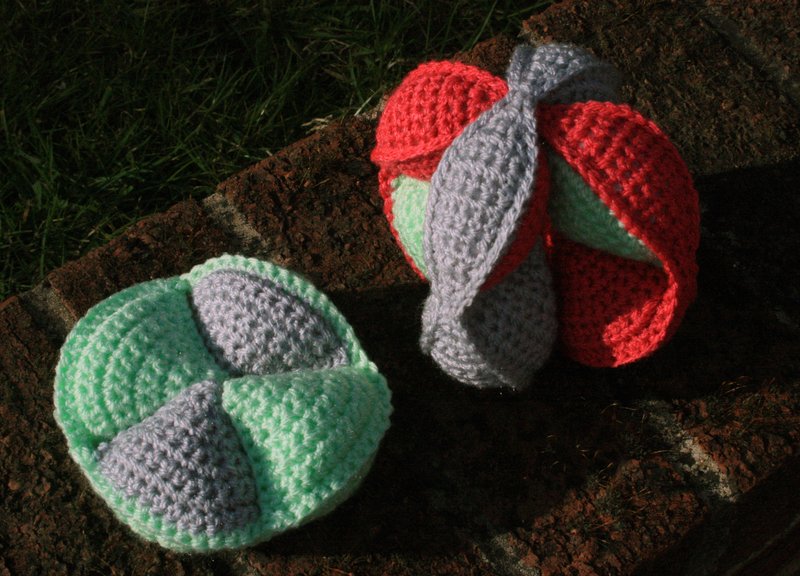 A huge thank you to Hannah over at not your average crochet for running the fantastic CAL and introducing me to some new stitch patterns. I am sure that many of us will be revisiting her pages again in the future to do this project again. And for anyone who has not joined yet remember it is never to late to join in, my sister at happy to make you joined at week number 12 and has now caught up with the current week. This is something that as soon as I saw it I knew I had to make one. 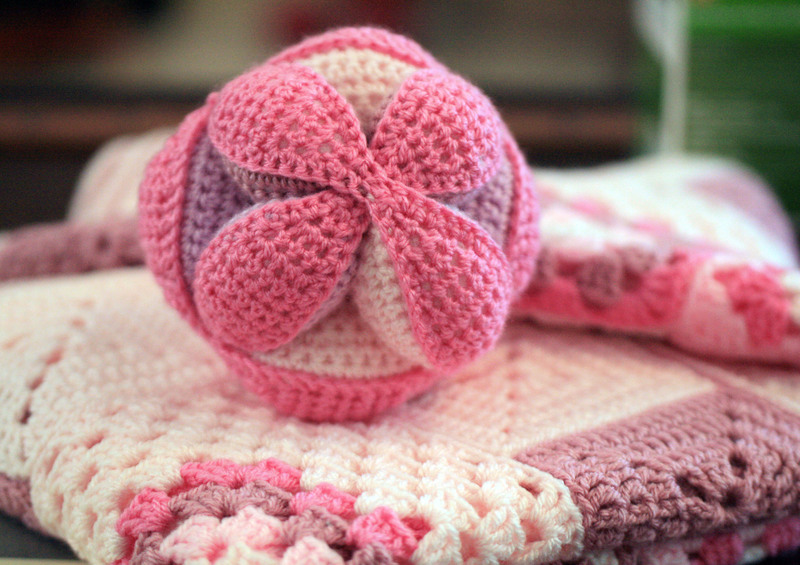 I have created this one in the same pinks as the baby blanket I made to make cute little gift set. 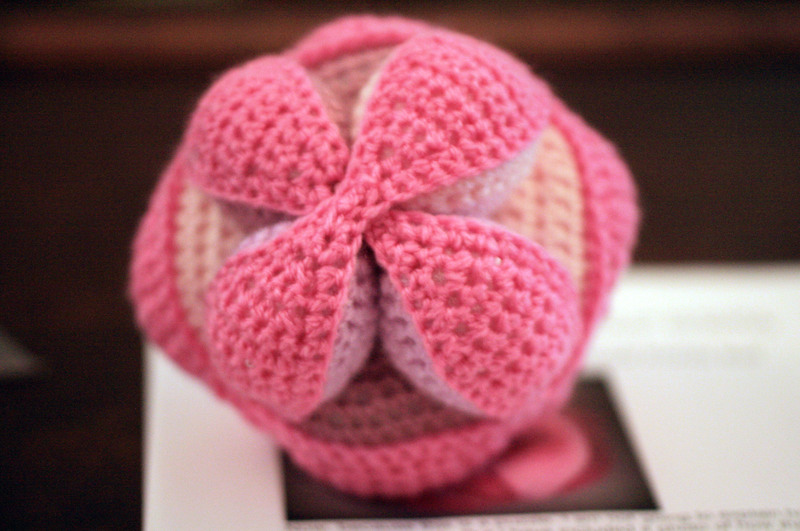 Made up of segments, the shaping of this little ball is ideal for little hands to grip and will also help with development and coordination, once they start crawling little ones will be able to push it or roll it along. 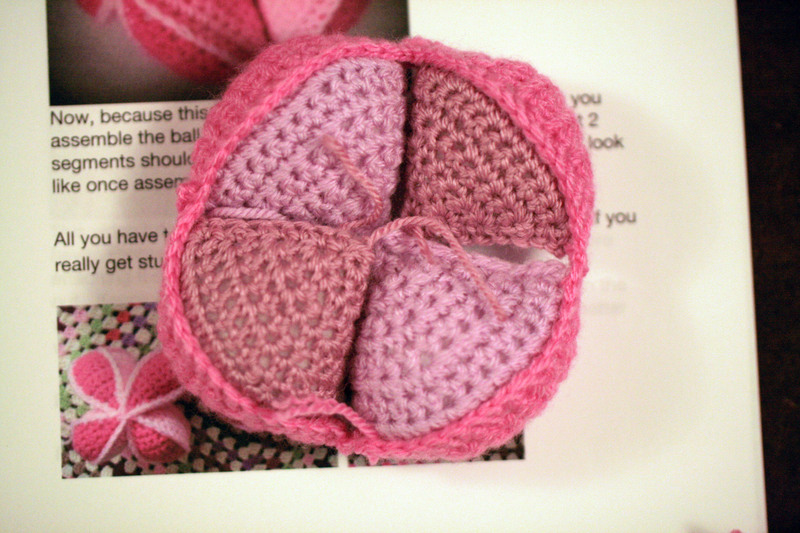 So here is how is looks through the stages, first, you make 12 segment pouches. Then you make a string of lids for your segments. This can be done as one long string or in 3 batches of 4, it really depends on your choice of colours, if you are using all one colour you can do it it one string. Once you have made all your segments and lids you can start to join them together stuffing them as you go. Once you have completed the first 4 they should look like this. Continue stuffing until you have all 3 done. Then all you have to do is slot them together to complete your ball. I saw this on make my day creative where you will find the link to this free pattern. 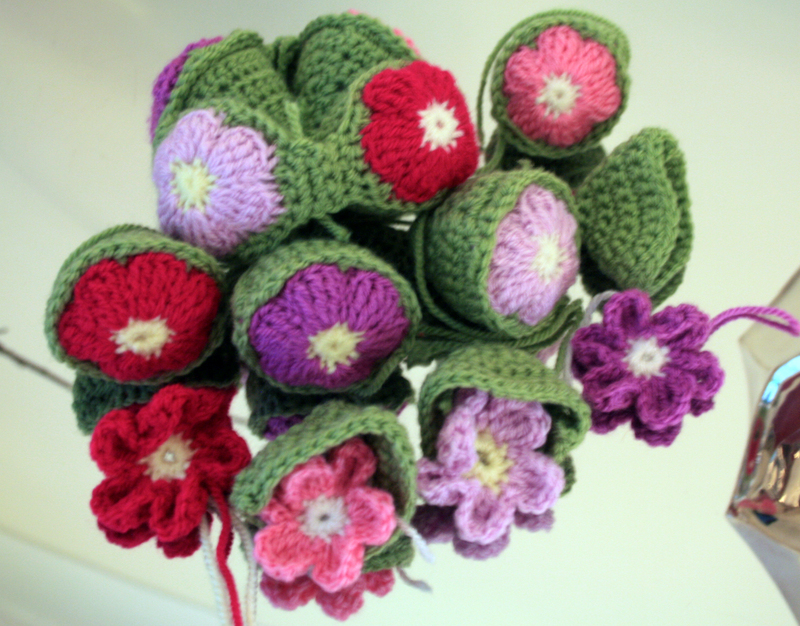 There are others too, animal and flower versions by the author Dedri Uys on Ravelry. I am going to try the flower one next. I am a little puzzled by the name Amish Ball, does anyone have any information?